We find Group 5's infograph not visually appealing as it does not attract the audience (us) alot. Although there are 2 faces, we do not know what they are there for. Does it serve a purpose on the infograph? We are not quite sure. This infograph tells us minor details of Suzhou Industrial Park, but they did not further elaborate. For example, in the top left corner, they wrote that in the late 1990, there were heavy losses which led to a minor scandal in Singapore. We are unable to know why there were heavy losses or how it led to a scandal. Overall, this infograph tells us the park's condition now but not alot about its history. 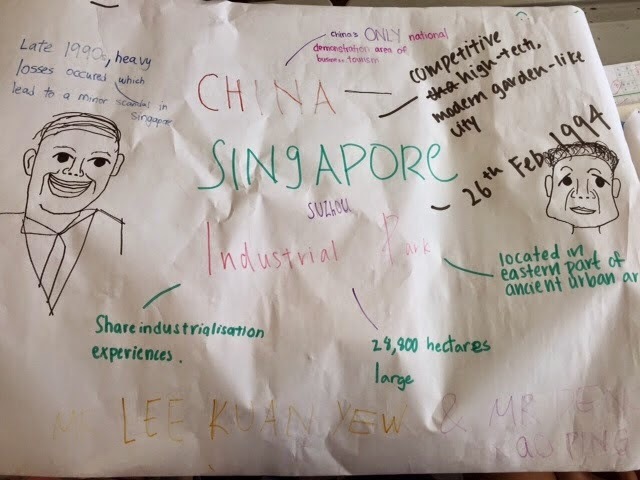 Their work could also have been improved if they included their personal views regarding the establishment and development of the Suzhou Industrial Park, and at the same time to make the effort to improve the poster's visual appeal to its audience.